A subset of the 2007 Commission letters is provided as PDF files below. Download times of large PDFs will vary based on connection speed (additional information on PDFs). Please contact mmc@mmc.gov to request copies of any letter. Please note that a complete list of the 2007 Commission letters and agency responses can be found in Appendix A of the Commission’s 2007 Annual Report. Comments and recommendations on development of a natural resources science plan for the Papahanaumokuakea Marine National Monument, Hawaii. Comments and recommendations on the advance notice of proposed rulemaking regarding issuance of permits for scientific research and enhancement activities. Reiterating comments and recommendations made previously on the proposed rule to designate critical habitat for the North Pacific right whale. Comments and recommendations on the draft recovery crediting guidance for recovery programs under the Endangered Species Act. Comments and recommendations on research on harmful algal blooms, the effects of anthropogenic sound on marine mammals, and creation of national marine mammal data archives, following the Commission’s 2007 annual meeting. Comments and recommendations on marine mammal observer programs, health issues related to stock assessments, and alternative methods for managing marine mammal/human interactions, following the Commission’s 2007 annual meeting. Comments and recommendation on the draft five-year status review for the Caribbean monk seal. Comments and recommendations on the report of the Columbia River Pinniped-Fishery Interaction Task Force. 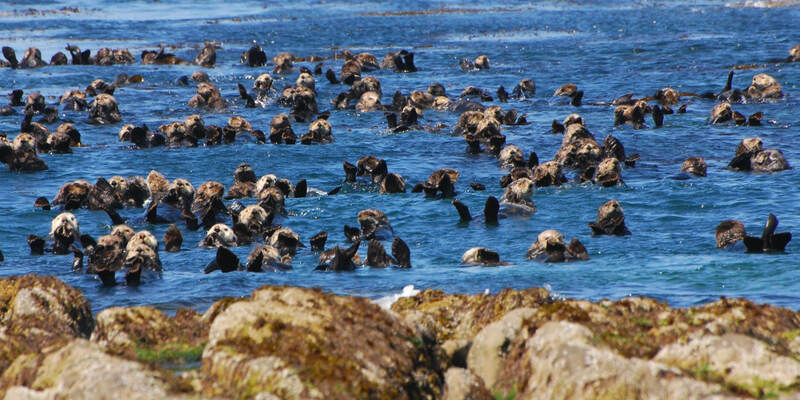 Comments and recommendations regarding northern and southern sea otters, following the Commission’s 2007 annual meeting. Commending the governors of Washington, Oregon, and California for efforts to implement an ecosystem-based management approach for West Coast marine ecosystems, following the Commission’s 2007 annual meeting. Encouraging support for a concerted effort by the United States and others to act to save the vaquita from possible extinction. Comments and recommendations on the proposal to list polar bears as threatened or endangered under the Endangered Species Act. Comments and recommendations on the draft 2007 stock assessment reports for marine mammals. Comments and recommendations regarding measures to protect manatees from harassment in the Crystal River, Florida. Comments and recommendations on the Draft Environmental Impact Statement/Overseas Environmental Impact Statement regarding use of the Hawaii Range Complex. Comments and recommendations on the Draft Environmental Impact Statement on annual quotas for the subsistence hunt of bowhead whales. Comments and recommendation on the Final Environmental Impact Statement on amendments to the Atlantic Large Whale Take Reduction Plan. Comments and recommendations on the proposed rulemaking regarding the 2008 List of Fisheries. Comments and recommendations on the revised draft recovery plan for the western and eastern distinct population segments of Steller sea lions. Advice to the Secretary of State to promote joint action and investment by the Mexican and U.S. governments to conserve the vaquita. Comments and recommendations on the proposal to list the Cook Inlet stock of beluga whales as endangered under the Endangered Species Act. Comments and recommendations regarding the draft Programmatic Environmental Impact Statement for seismic surveys in the Beaufort and Chukchi Seas, Alaska. Comments and recommendations on a proposed rule on the taking of marine mammals incidental to U.S. Navy operations of SURTASS LFA sonar. Comments and recommendation regarding draft summary and evaluation of the five-year review of the southern right whale listing under the Endangered Species Act. Comments and recommendations regarding the Draft Programmatic Environmental Impact Statement (DPEIS) on NOAA’s Marine Mammal Health and Stranding Response Program. Comments on a request from the Pacific Islands Fisheries Science Center for a reserach permit to conduct shark control in the Papahanaumokuakea Marine National Monument. Comments and recommendations regarding a 12-month petition finding and proposed rule to list the polar bear under provisions of the Endangered Species Act (ESA) as a threatened species throughout its range. Comments and recommendations regarding applications from Oregon, Washington, and Idaho seeking lethal removal authority for pinnipeds preying on salmon and steelhead in the Columbia River. Comments and recommendations regarding the Draft Programmatic Environmental Impact Statement on the effects of permitted scientific research activities on threatened and endangered Steller sea lions and depleted northern fur seals. Comments responding to a 5-year review of the status of the Hawaiian monk seal under provisions of the Endangered Species Act. Comments and recommendation regarding the Service’s 5-year reviews of the status of fin whales, sperm whales, and southern right whales under the provisions of the Endangered Species Act. Comments and recommendations regarding recent video evidence of harassment of manatees in King Bay, Florida. Comments regarding MMC’s interest in working with NMFS to organize and facilitate a meeting to develop a more effective course of action to address the current Hawaiian monk seal recovery crisis. Comments and recommendation regarding the taking of Cook Inlet beluga whales by Alaska Natives. Comments and recommendations regarding a proposed recovery plan for the southern resident stock of killer whales. Comments on efforts by the Indigenous People’s Council for Marine Mammals to secure stable funding for Alaska Native organizations and co-management of marine mammals in Alaska. Comments and recommendations on a proposed rule to recognize the North Atlantic and North Pacific right whales as separate species consistent with taxonomy used by the scientific community and organizations. Comments and recommendations regarding the Draft Framework for Developing the National System of Marine Protected Areas. Comments and recommendations regarding the Draft Manatee Management Plan. Comments and recommendations regarding the Draft Interim Visitor Services Plan for the Midway Atoll National Wildlife Refuge to assess possible impact on Hawaiian monk seals and spinner dolphins. Comments on the Service’s proposed review of the status of the Caribbean monk seal under the Endangered Species Act, with the conclusion that the Caribbean monk seal is extinct and should be removed from the list of endangered and threatened species. Comments and recommendations regarding the Draft Recovery Plan for the Hawaiian Monk Seal. Comments and recommendations on the need for the National Marine Mammal Laboratory and other NMFS research facilities to establish Institutional Animal Care and Use Committees (IACUCs) as required under the Animal Welfare Act. Comments and recommendations regarding a proposed rule for the 2007 List of Fisheries under the Marine Mammal Protection Act.